MOMS who love to save also love to share their money saving ideas. So, email us at trisha@247moms.com and share your money saving ideas! Enjoy this week's thrifty finds! As a little girl I used to love it when my mom took me to our local bakery outlet store, and I got to choose the bread and treats for my school lunches, as well as some yummy breakfast items. My mom loved the money she saved shopping at the bakery outlet. These bakery outlets carry a variety of brands, such as Hostess, Wonder, Dolly Madison, Good Hearth, and so much more. Shopping bakery outlets allows you to purchase items at reduced prices in comparison to your local grocery store. So, save money and shop your local bakery outlets. Often what keeps me from purchasing items online is the cost of shipping. I am always trying to decide if driving to the mall is cheaper or more expensive than paying shipping for my online purchases. Today I found a great web site that helps me find FREE shipping offers for my online purchases. Check it out at http://www.freeshipping.org/. I can easily search for the online store I am wanting to purchase from and see if they have any FREE shipping offers/codes. So, now I will search first for FREE shipping before I head to the mall and pay my $3.00 bridge toll and drive my 10.7 MPG Excursion. You can find coupons on cookie mixes, Yoplait and Trix yogurt, Progresso soup, fruit roll-ups, Cheerios mix and several cereals. You can sign-up to receive a free newsletter that will keep you in the know of the latest coupons, recipes and more . Circle of Friends' one mission has been to create a professional hair, bath and body line for kids while introducing them to a world of styles and cultures. And they have done just that. This amazing line of kid products has been formulated using the highest quality ingredients, such as exotic botanical extracts, natural elements and enchanting fragrances and packaged in “kid friendly” bottles/packages. Each kid friendly bottle depicts a character or friend from various parts of the world and includes a short story on the back of each product telling about the character's life in his or her country, including interesting facts about what he or she does for fun. Circle of Friends continues to share with our kids about their new friends on their web site http://www.circle-of-friends.com/, featuring interactive games and monthly newsletters full of great informative stories and more. My first discovery of these wonderful products was 10 years ago while getting my girls' hair cut at the local Fun Kuts children’s hair salon. There along the wall was this display of fun smelling hair and bath products. Over the years I have used many different products from Circle of Friends. Each and every one has become a favorite. Their newest product, Lice-Free Zone is a must-have for every family as our children head back to the classooms this fall. Ack - just the idea of our kids getting lice is enough to make you run out and purchase this Lice-Free Zone shampoo and conditioner to be pro-active when the first possible outbreak happens in your local school (and it will). 24/7 MOMS is looking for moms to test some of these amazing Circle of Friends products and share their reviews with us. Leave us a comment with your email address or email trisha@247moms.com with your email address for your chance to win 1 of 9 different Circle of Friends products. (24/7 MOMS uses the random number generator in its contests). Contest Ends September 30, 2008. Be sure to check out the Circle of Friends web site - it's full of great mom tips and fun, interactive games for the kids. Have you surfed the Food Network web site? 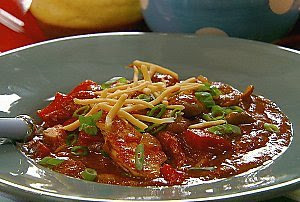 http://www.foodnetwork.com/ is a mouthful of cooking information from recipes to video cooking demos to cooking with kids and so much more. My favorite find on the Food Network site was 5 simple meals to create using the pre-cooked rotisserie chicken you can purchase at your local grocery store, Costco or Sam’s Club. I personally purchase mine at Costco, because they are less expensive and tend to be a little bigger than the grocery store ones. With my hungry family of 7, bigger is better. For the glaze: In a saucepan over medium-high heat, combine the honey, mango juice, brown sugar and lemon juice. Bring to a boil and cook until the sauce coats the back of a spoon, about 5 minutes. Place chicken on a nonstick cookie sheet. Using a pastry brush, coat chicken with a generous amount of glaze. Place mango slices over breast meat to create a zebra stripe. Insert toothpicks to secure slices into chicken. Bake chicken just until warmed throughout, about 12 minutes. Remove chicken and discard toothpicks. Garnish with fresh basil. Heat the oil in a large sauté pan over a medium heat. Add the onions and cook until they are soft and translucent, about 5 minutes. Add the garlic and cook for 1 minute more. Add tomato sauce, tomato paste, water, vinegar, molasses, pepper and liquid smoke and bring to a boil. Reduce heat to medium-low and simmer for 15 minutes. Add chopped chicken, return to a simmer, and cook an additional 10 minutes. Split rolls. 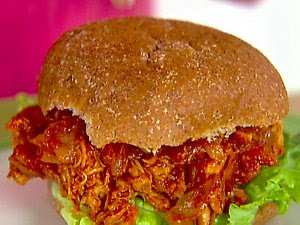 Place a leaf of lettuce on each roll, and then pile on 3/4 cup of the chicken mixture onto the roll. Preheat oven to 350°. Spray a 9x13" baking dish with nonstick cooking spray. Combine meat, celery, red grapes, carrot and scallions. Add yogurt and curry to the salad, and toss to evenly distribute the curry. Season the salad with salt and pepper, to your taste. To dress the greens, add salad to a bowl. In a second bowl, combine chutney and vinegar. Whisk in oil. Drizzle dressing over greens and toss. To assemble, pile dressed greens on a plate. 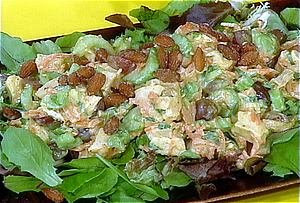 Using an ice cream scoop, place 2 scoops of chicken salad on greens. Garnish with toasted almonds. In a large Dutch oven, heat the olive oil over medium heat. Add the garlic and onion and saute for 5 minutes. Add red bell peppers and jalapenos and saute for 5 more minutes, until soft. Stir in chili seasoning packet and cinnamon and cook until spices are fragrant. Add tomatoes, pinto beans, shredded chicken, and beer. Bring to a boil, reduce heat to low and simmer 10 minutes. Stir in chocolate just before serving. Garnish with grated cheddar and chopped scallions, if desired. Place the garlic cloves in the bowl of a food processor. Pulse until the garlic is finely minced. Spoon the minced garlic into a jar and pour over enough oil to cover the garlic. Seal well and store in the refrigerator for up to 1 week. Do you have a special recipe using rotisserie chicken? Share it with the 24/7 MOMS! Get Cozy, Josey, by Susan May Warren. Details at http://247moms.blogspot.com/2008/08/247-moms-august-book-review-offer.html. Win one of three product review opportunities for Fun Slides Toys. Your kids will love these! For all the details, go to: http://247moms.blogspot.com/2008/08/august-product-review-contest.html. 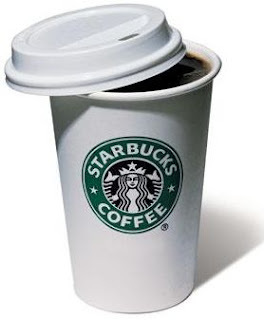 Free Starbucks for Mom Bloggers - click here for more details: http://247moms.blogspot.com/2008/08/free-satrbucks-for-mom-bloggers.html. As the hours went by, and the time continued to tick away, the much anticipated call never came. Then I had a "YOU'VE GOT MAIL" moment. There it was - an email from my Indiana (#1 Son). He did it, or should I say did it - I made it through the first day. Believe me, they tell us about how the years fly by. Well, enjoy them now. It is so true! I still can not believe my baby boy is 19, and off to Europe alone, only to arrive home to embark into the world of college next month. Moms, enjoy each and every moment with your kids. Yes, it can be exhausting and overwhelming at times, but embrace the everyday moments you have with your kids. It truly flies by, and before you know it you, too, will be sending your first one off to college. Hopefully, not on a solo trip to Europe like my Indiana. Okay, Okay. Here are the pictures you have requested after my blog post story of my wonderful hubby giving my boys mohawk haircuts while I was away. If you missed the story/post "When Mom Is Away", besure to click herehttp://247moms.blogspot.com/2008/08/when-mom-is-away.html, read the story/post and watch the You Tube video created with my new Casio Exilim camera. Yes, these pictures were also taken with my new Casio Exilim. Can you tell I love my new camera? I went online and flight NW 106 has officially arrived in London, which means Indiana (Stephen, Jr.) has now survived his first solo flight across the world without Mom and Dad. And, I survived my first night of sleep knowing my son was thousands of miles away from us. WHEW! Now we await the first phone call from him to see how our own Rick Steves is surviving the streets of London. What did he eat? Did he find a place to sleep for tonight? Did his luggage (backpack) make it to London with him? Does he miss us yet? All of the important questions for which a mom needs answers. ing. So, trying to be excited for him was the challenge. We let go, drove away, and began texting our final words of wisdom to our Indiana (son), knowing he would soon turn his phone off and board the plane for his long flight. During our drive back to the Harbor, Caleb told us it was time to call Stephen and tell him to come back. Must be nice to be missed that quickly by your little brother. 24/7 MOMS is in the NEWS! Yes, ladies, we have made our first newspaper appearance. Second, leave a comment about the article and 24/7 MOMS for others to read by clicking the Click here to view/post comments - at the bottom of the article. Third, copy and paste the article link and email it to every local newspaper in your area and every mom you know to get the 24/7 MOMS buzz moving across the country. If you have another great idea for getting the 24/7 MOMS buzz moving across the country email us at trisha@247moms.com and let us know. We want every mom to be part of the 24/7 MOMS community, so she too can be inspired, equipped and connected during her mom journey. 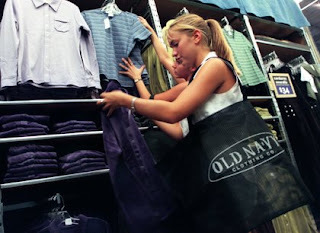 This Saturday, August 23, 2008, Old Navy is having an incredible jean sale - Select styles of Adult Jeans will be $12.00 each, and Children's Jeans will be $7.00 each. Limit 3 pairs per person. I recently purchased a pair of the new Diva Skinny jeans and I love them. Be sure to shop early for best selection. This is a sale you don't want to miss. For the Novotnys it will be Old Navy Jeans for our back to school wardrobes, considering the little boys are in desperate need of new jeans. While on vacation this summer I discovered a new seasoning that I have been using on a weekly basis. It's called California style garlic salt with parsley by McCormick. Two of our favorite ways to use this new seasoning aremaking garlic bread and in our sautéed veggies and pasta side dish. I discovered a new chewing gum by Wrigley’s: EXTRA Fruit Sensations. It comes in 4 flavors: Island Cooler, Sweet Watermelon, Berry Paradise and my favorite flavor Strawberry Banana. I often have a hard time finding my favorite flavor at my local grocery or Target stores. The flavors are yummy and long lasting. The only problem is my 5 kiddos now know Mom has this amazing gum in her purse, so it doesn’t take long for my yummy package of gum to become empty. My husband brought these yummy new treats home with him the other day: Planters Kettle Roasted Peanuts. They are extra crunchy, and one handful is just not enough. They come in a variety of flavors: Classic Salt (my favorite), Honey BBQ and Ranch Kettle. The packaging is also great - it is a re-closeable zip pouch rather then a can or jar. It's great for traveling and easily accessible. I am sure your kiddos will enjoy this new snack from Planters. With two teen daughters who have become addicted to wearing make-up daily and sometimes re-applying it hourly, I have searched and searched for a brand that looks natural on them and not caked on. My latest make-up find is Bare Escentuals (http://www.bareescentuals.com/),made from 100% pure bare minerals. My two girls are very thrilled with their new make-up, and I love their new look - more natural and healthier for their young skin. It is also available at Nordstrom and Sephora. You can also find it online at Sephora (http://www.sephora.com/), Nordstrom (http://www.nordstroms.com/) and Bare Escentuals (http://www.bareescentuals.com/). I purchased my girls the getting started kit. Not only was it the best deal, but it also came with everything they needed to begin using their new make-up. Do you have a FAVORITE this week? Leave a comment and share your favorite this week. Today's the day. My #1 Son, Stephen, will board a plane tonight at 10:15pm and fly across the world to Europe to begin his 29 day adventure of traveling throughout Europe alone. Yes, I said alone. My 19 year old #1 son has traveled twice before to Europe with Dad and decided he was ready to venture out on his own Indiana Jones adventure. Yes, I am becoming a freaked out mother - possibly even neurotic at this point. I can't think too much about my Rick Steves (#1 Son) walking the streets of Europe alone carrying his backpack on his back. Let alone the thought that in his backpack is a sleeping bag, tent, blow-up pillow, flash light and a few changes of clothes, as his idea of traveling throughout Europe is camping. Can one kid make a mom freak out any more than this? So, my dear 24/7 MOMS friends, be prepared to read/hear my freaked out neurotic Mom moments over the next 29 days as I wait for his every other day check in phone calls. As I wear out the carpet from kneeling on my knees praying for his safety. As I try to occupy my life with my 4 other children to keep my mind from completely going crazy. You might be asking, "Why would he choose to do this?" I can only come up with two answers. 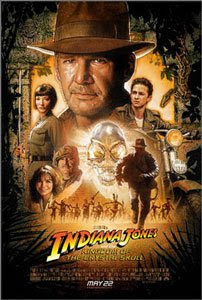 One, he obviously watched one too many Indiana Jones movies and has decided he is the Indiana of 2008. Two, because the Rick Steves travel bug got into my kid when he was 12 years old and took his first trip to Europe. The trip was meant to be a missions trip to expose him to experiences in other countries, not to give him the travel bug. I guess I have my gypsy mother to blame for this one. She, too, has the Rick Steves travel bug and would prefer to only be in America to check her mail and kiss her grandkids, then get back on a plane and continue to experience new destinations. Ahhh - it's in the blood. Do you think #1 Son can get a few blood transfusions and clean out this travel bug in him? Oh, did I mention the #1 Son will arrive home only 36 hours before he leaves for college, and no, he has not packed one thing for college. His focus is on Europe, not his future education. I guess that's a 19 year old Indiana Jones for you. So, I am facing a 29 day Freak-Out with #1 Son traveling through Europe, only to have him arrive home and face my next Freak-Out session, dropping him off at college. Ahhh - someone get the straight jacket, and I mean soon. nt to know the color!). It is AMAZING - 10.1 megapixels and compact enough to carry in my purse everyday. So, why choose the Casio Exilim? You Tube Capture Mode: I can now record high quality videos. Watch out - 24/7 MOMS may be creating its own You Tube movies for moms. Self Portrait Setting: I can now take a portrait of me, alone or with someone else, without cutting my head off. When I use the self portrait mode setting it will automatically shoot when our faces are completely in the frame. Super Clear LCD Screen: I have struggled with taking digital pictures using a screen rather then the old fashioned way of looking through the viewfinder with one eye, but now with my new Exilim's super clear LCD I can see clearer than ever, even out in the amazing sunshine. Movie Button: I can record those precious moments of my kids without having to change the setting on my camera. I can go from taking still pictures to recording video instantly. Auto Shutter Panning: No more blurry action pictures. They are now sharp and clear. Auto Shutter Direct Blur: My Exilim only shoots when there is no movement or shaking. Whew! Again, clear crisp pictures every time. Those are just a few of the reasons I am so excited about my new birthday present. So, Say Cheese, and put this AMAZING camera on your wish list. Better yet, treat yourself to a Mom gift and purchase one today! trisha@247moms.com . Include your name and email address. 24/7 MOMS want to know your secret ways of saving money, bargain shopping, couponing or finding FREEbies! Share them with us by sending an email to trisha@247moms.com to be used in an upcoming 24/7 MOMS publication. Hooray for Free-bates! http://www.freebates.blogspot.com/ is a GREAT place to find the latest rebates available on products we use. 1. Arm & Hammer Essential Cleaners starter kit - FREE with rebate. 2. Office supplies at Office Depot and Staples. You do NOT need to be a member to use it. We have THREE FREE product review opportunities this month with Fun Slides Toys - YOur kiddos will love these new indoor games. Win one of these great products by Fun Slides http://www.funslides.com/ a Mini Carpet Hockey, Carpet Bocce, or Carpet Skates by sending an email to trisha@247moms.com . Include your name and email address. Drawing will be held August 30, 2008. With summer winding down and the pace of life about to pick up, when that school bell rings once again for the Novotny family I, the Mom, will once again be looking for Quick and Simple meals. One cookbook I came across recently is 4 Ingredient Recipes for 30 Minute Meals, by Barbara C Jones. Now I call that simple! Very few ingredients to locate and/or buy and very little time spent cooking. This cookbook is filled with complete meals and recipes, shortcut ideas and grocery shopping lists. Could you ask for anything more? I know, a chef to cook your meals would be a nice bonus to your Mom world. This cookbook is all about having family dinner together, getting dinner on the table and serving your family in 30 minutes or less. Here is a sample menu right out of 4 Ingredient Recipes for 30 Minute Meals, by Barbara C Jones. Add a little oil to large skillet over medium-high heat and cook potatoes for 7 minutes, turning frequently. Add seasonings ( 1 tablespoon minced garlic an d2 teaspoons paprika), if you like. 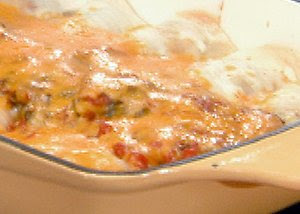 Wash asparagus and spread in foil lined baking dish. Spread olive oil over asparagus with fingers to coat. Sprinkle basil and salt over asparagus. Bake uncovered at 400 degrees fro 12 minutes. Serve immediately. 1. Place about ½ the shredded lettuce on individual salad plates with 1 or 2 peach halves. Spoon 1 heaping tablespoon cottage cheese over peaches and sprinkle craisins over top. Place strawberry cake on cake plate and spread with icing. 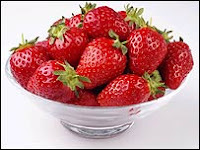 Garnish with fresh sliced strawberries. Do you have a complete meal menu plan to share with the 24/7 Moms? Email trisha@247moms.com and share your menu plan and recipes, to be published in a future 24/7 Moms publication.